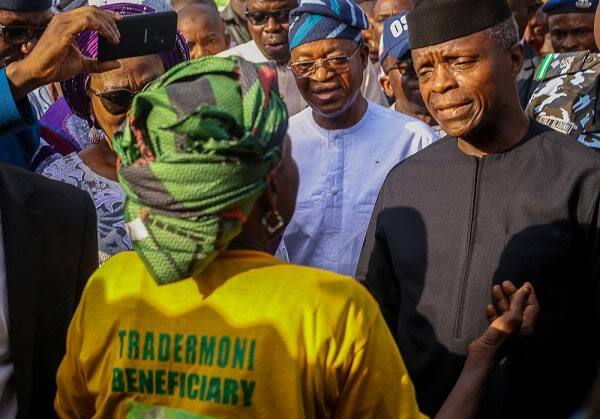 Vice-President Professor Yemi Osinbajo has denied the rumored suspension of the Trader Moni scheme- an empowerment scheme designed to provide funds for petty traders and artisans in Nigeria, following the reelection of President Buhari. Laolu Akande, the Vice President’s media aide made the disclosure on Wednesday, saying the government has continued giving the loans since the All Progressives Congress (APC) won the elections. He said the scheme would reach 10 million petty traders in the country. Osinbajo had served as the poster boy for the scheme, visiting markets and facilitating the grants in the lead up to the elections which led to opposition accusing the APC of buying votes under the guise of the scheme. In the aftermath of the elections, the degree of the VP’s face time to the scheme seems to have wavered.